Cards by America: ODBD's 2nd Year Anniversary Celebration Days Continue!!!! ODBD's 2nd Year Anniversary Celebration Days Continue!!!! We're having a blast celebrating with you! This is Day 3, Challenge 3. Traditional gifts for special milestones in a marriage like the 25th and 50th Anniversaries are SILVER & GOLD. So, for this challenge, we are to incorporate silver and, or, gold into our projects. Please note that these must BE NEW creations, (no back links please) and linked to Mr Linky posted on the ODBD blog by 8pm EST tonight! The winner will be chosen by random, will receive a $25.00 Gift Certificate to the ODBD Store & will be announced on the ODBD Blog tomorrow when we issue the next day's challenge! *If uploading to SCS or other on line gallery, please use this challenge's key word ODBD2AC3. Blogcandy winners will be announced by the individual blog owners the following day. There will be a final announcement on March 19th on the ODBD Blog recapping ALL the Anniversary challenges, the blog candy, and the winners! So be sure to check back then!!! Accessories: GOLD photo corners, GOLD Brads, GOLD ribbons, GOLD Embossing Powder, Spellbinders Cross Collection & Martha Stewart Corner Punch. This is gorgeous. I love the depth and textures and punched corners are beautiful. The sentiment is so inspirational. America this is pure luxury!!! I just love this SB Cross and the gold... it's so elegant!!! Just beautiful my friend!!! *GASP* STUNNING!!!!! Everything you make is gorgeous and this is no exception!! Love this gorgeous gold card!!! Oooh, isn't that yummy? Wow!! So stunning, and love the large, wrapped ribbon! A perfect touch to your gorgeous card! Have a blessed day! Oh my goodness. What a stunner! Absolutely love all the elegant details! omgoodness! work of art! just beautiful!! This is amazing, breath taking! Great job! Very stunning. Love the SB cross & punch. God bless! This card is just over the top gorgeous and super inspiring. Wow How very beautiful!! Love all of the layers! Wow! What a beautiful card - I love the depth you have managed to create with your punching and layering! This is so rich and elegant America!! I just love all your gold, the depth and the textures on this card!! Stunning take on the silver/gold challenge my friend!! You rocked this challenge my friend! Wow very elegant and fit for a King! America, I always love to see your name on my list- you have the most elegant beautiful cards. This is just amazing. America, America!! This is just AMAZING girl!! WOWZA...pure elegance and beauty!! This card just shines!! How perfect!! America, I am so inspired by the white/cream and gold tones. It is stunning! Very rich looking! I know someone who would LOVE getting a card like that! Absolutely beautiful card, America. Just love it. Fantastic work. Thanks for sharing. America this is just Stunning!! Wow, what a card! It is so layered, it almost looks upholsterd in the picture--a really cool look. Whew, your card took my breath away. I am not a fan of gold but you made this absolutely beautiful. Thank you for sharing such a work of art. Beautiful card! I love all the layers! Wonderful card! Your choices of gold and textures are beautiful, and the punches add that perfect touch! Beautiful job. This is amazing. WOW! Love the elegance! Someone will be truly blessed when the receive this beauty! Wow so gold and shiny!! Very pretty!! What a spectacular card you`ve created, America! Love all the layers and the gold with the white is just so elegant. Beautiful!! Oh my, this is gorgeous! I love that corner punch! Your card almost looks like it's got batting behind it or upholstered, you know what I mean? So pretty! Really pretty, I love the verse! I teared up when I saw your card. I wasn't expecting to see this glorious cross and the gold. This paper, looks just like fabric. Lush fabric. I love the details you gave the cross. I actually need to stop typing. Because I can't find the right words for this breath-taking piece. What a striking card! Thanks for sharing! So rich and elegant-looking! Great job! *THUD*...smelling salt, please! This is beyond GORGEOUS, America!! You totally rocked out on this challenge!! Simply wholesome, golden goodness! 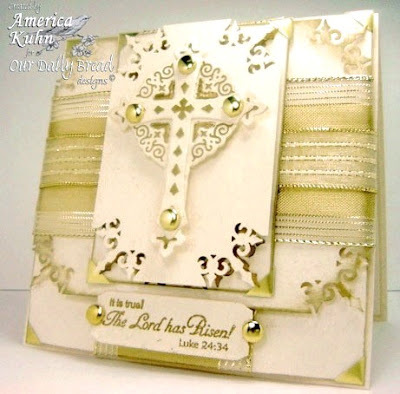 I soooo love that Spellbinders cross!! WOW, just spectacular! I love the Nesties Cross. I bought it and can't wait to use after seeing your gorgeous card. Thanks for sharing it with us today. Ohhh this looks SO REGAL and perfectly suited for ROYALTY! WOW! Love this! This is luxury! Your cross is awesome, great job with the "gold". WOW! Gorgeous! 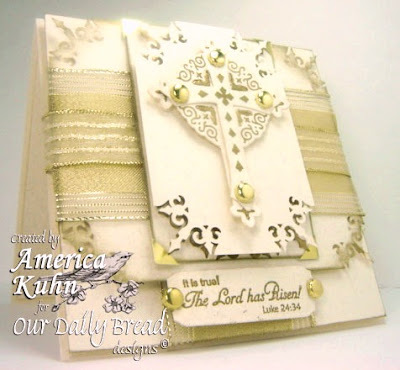 Love the spellbinders cross and everything else! Beautiful. Love the wrapped ribbon. What a truly elegant card! You have outdone yourself! The cross is beautiful. I love the gold! Lovely, especially the punched corners. Oh my! I've been wanting this cross set and your card is lovely! What a breathtaking card! It is so regal; perfectly befitting the one who it's about. This is jaw dropping beautiful. The colors, shades and details..WOW . Oh my word!! This is drop dead gorgeous girl!! This is one amazing card! !